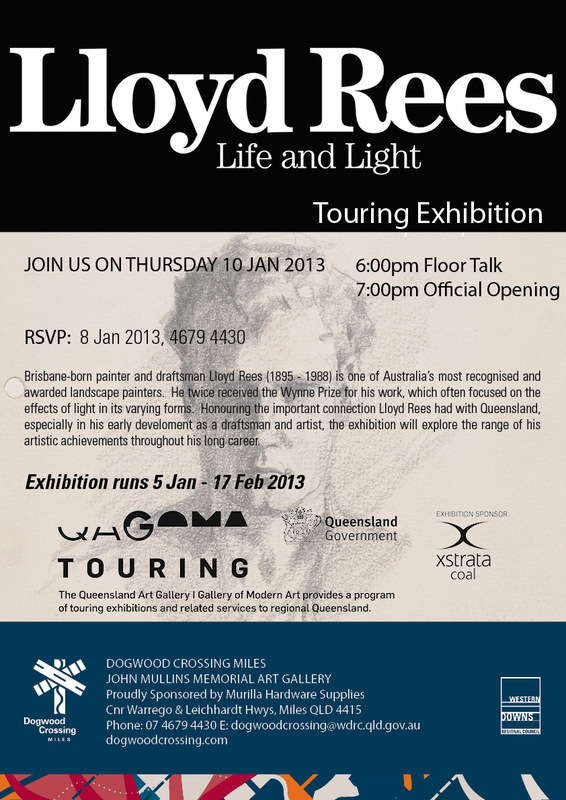 Brisbane-born painter and draftsman Lloyd Rees is one of Australia’s most recognised and awarded landscape painters. He twice received the Wynne Prize for his work, which often focused on the effects of light in its varying forms. 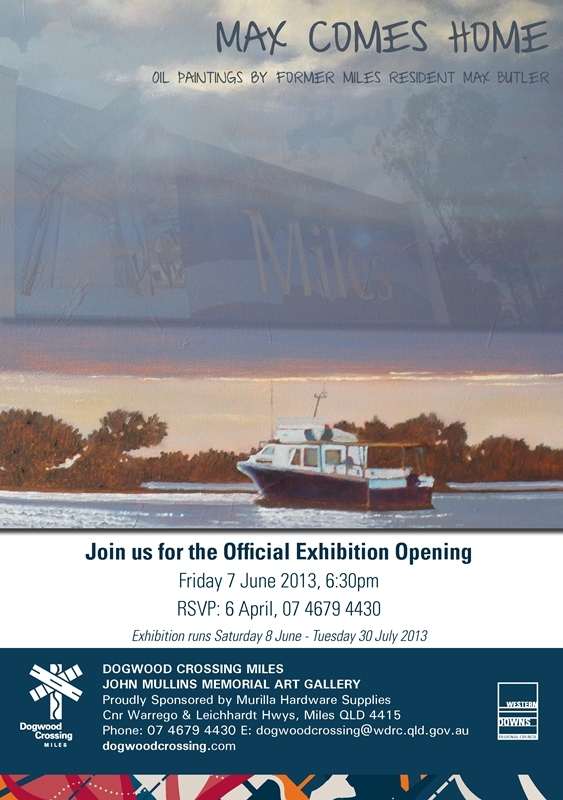 Honouring the important connection he had with Queensland, the exhibition will explore the range of his artistic achievements throughout his long career. Landscape artist June McCotter seeks to share the offering of wholesome, healing and reflective moments brought to us by our own Earth’s landscapes. Using her own land as inspiration, June paints the subtle changes of the seasons, temperature and light. With bold compositions, unique strokes, and a personal collection of colours, she expresses the universal. The Studio Project features a selection of the region’s artists, revealing the working spaces in which their art is created. Each artist kindly opened up their studios for documentation, offering a rare insight behind the scenes of a practising artist. Each space boasts an eclectic array of art materials, supplies, collections of pictures, photos and knick-knacks that inspire ideas and provoke memories. Max Butler was born in Miles in 1944, attended primary school in Drillham and then secondary school in Miles. He left Miles at the end of 1960 to persue teaching. His career as a school principal started at Guluguba and continued for the next 30 years. 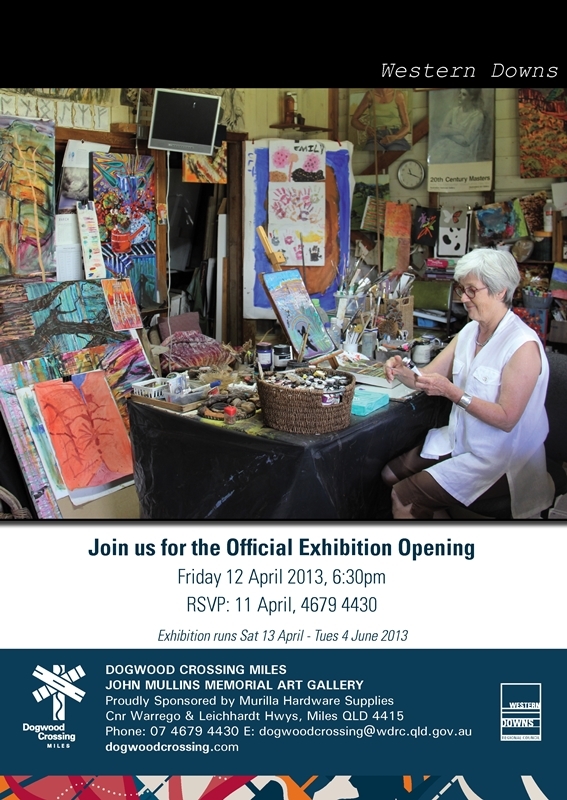 Max and his wife Pam now travel Australia, capturing the countryside in his colourful ‘My Country’ Series. After an absence of more than 50 years, Max now returns home with a selection of these paintings. 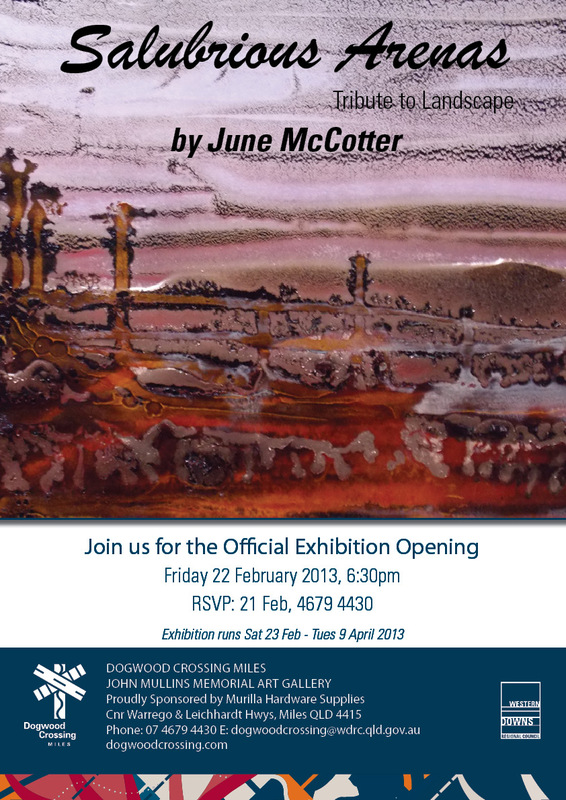 John Mullins Memorial Art Gallery | Who Do You Think You Are? 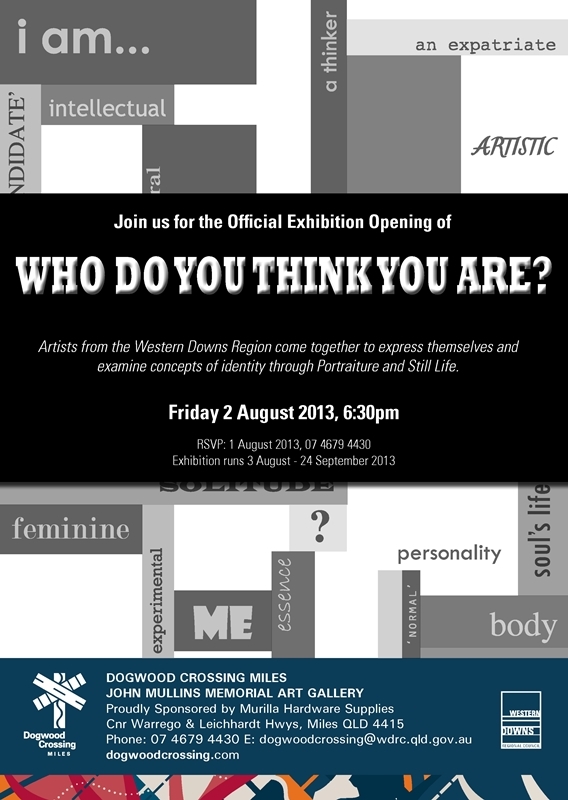 An exhibition in which Western Downs Artists respond to the theme Who Do You Think You Are? Artists are asked to define a concept of identity utilising the genres of Portraiture and Still Life and through this visual exploration establish a personal ‘profile’ that reflects something about the subject. The work of these three artist tones evidence of their sensibility and response to Memory, whether that of place, people, or as Mann states – ‘The body. The body remembers like a rhythm felt but not yet heard.’ Recording the imprint left by man is common to all three artists, and each does this in a unique way. 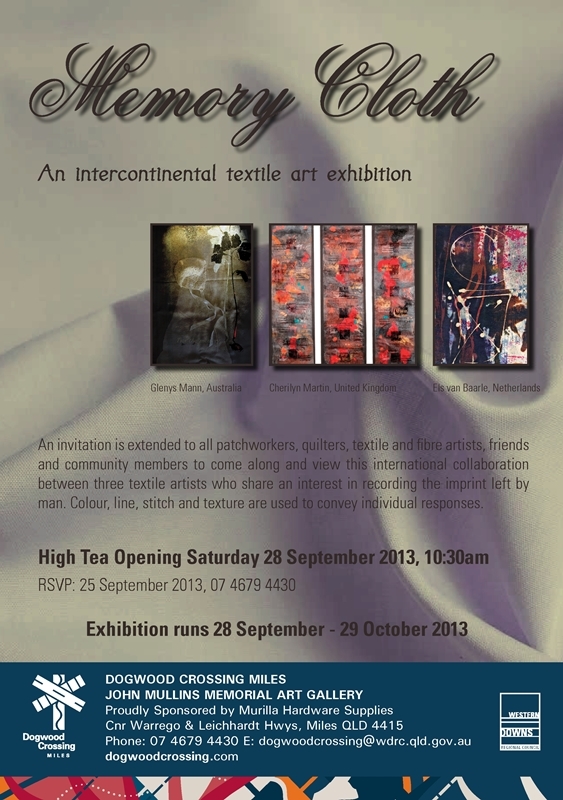 Colour, line, stitch, and texture are used to convey individual responses. 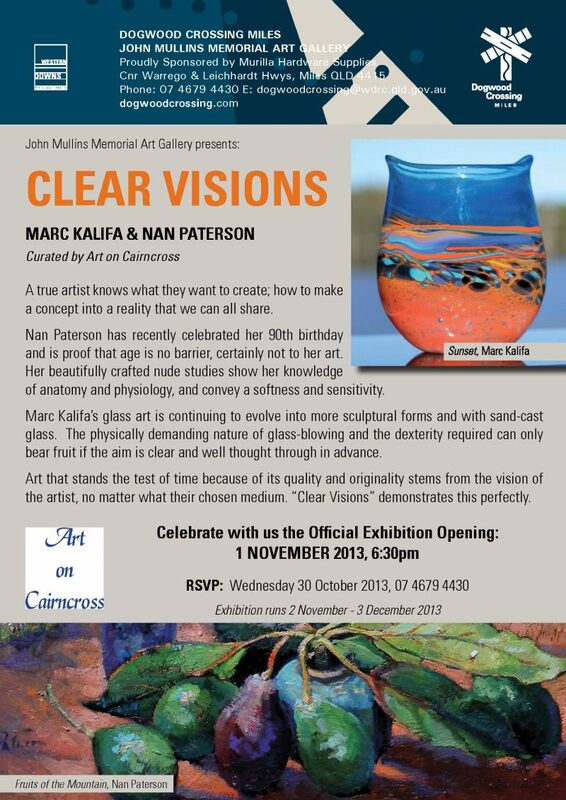 Marc Kalifa has been glass blowing for 25 years inspired mostly by his local environment around Maleny. His recent works explore the slow changes to mountains through the effects of weather. Nan Paterson is one of Queensland’s most senior artists, whose classical style shows how beauty from nature can be celebrated timelessly in art. This exhibition focuses on bridging elements of the mechanistic and industrial to the organic and natural patterns of growth and decay. The woven fence wire that is used in the pieces juxtaposes the feminity of domestic techniques such as needlework or knitting. 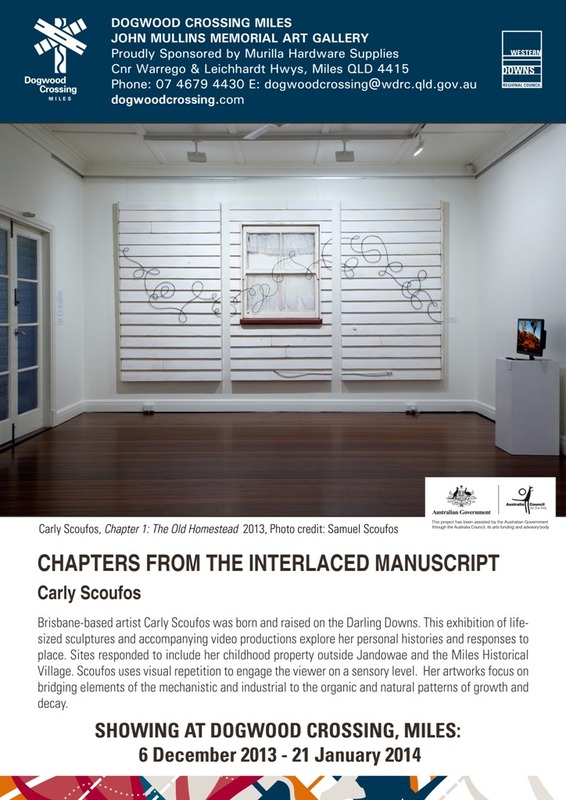 Carly’s artwork also seeks to create a perceptual pull between two-dimensional sculpture and three-dimensional drawing.